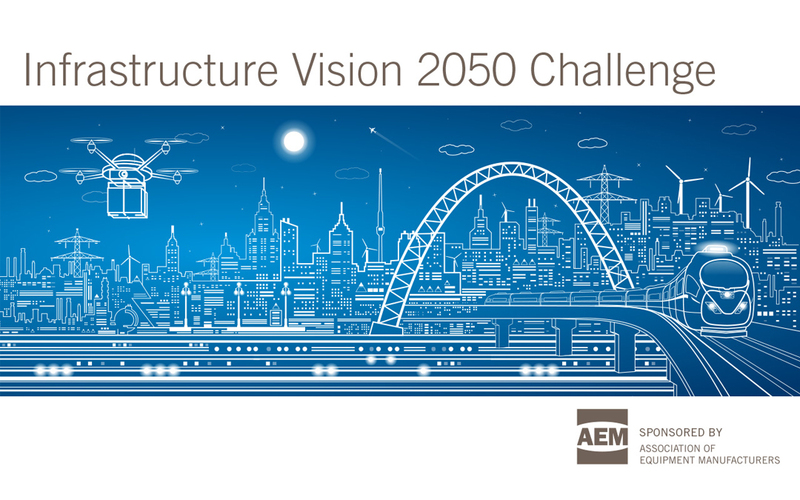 The Association of Equipment Manufacturers (AEM) is sponsoring a $150,000 incentive prize called the Infrastructure Vision 2050 Challenge. The goal is to move beyond the cycle of patchwork fixes and deferred maintenance and start a conversation about the infrastructure opportunities of the future. The three-phase, crowd-sourced competition will award multiple prizes for innovative ideas to overhaul the crumbling infrastructure that Americans rely upon to move people, materials, products, services and information. The “Complain Phase” of the competition, launched Jan. 19, asks the public to describe the biggest infrastructure challenge facing their community. It will award $250 prizes to 10 finalists, with the overall winner collecting $2,500. The deadline to enter is March 15. The “Dream Phase” will solicit new thinking and solutions, especially from non-experts. Five winners will receive $9,000 each. The deadline to enter is May 31. The final “Build Phase” takes the second phase a step further and solicits plans to implement those solutions on a larger scale, with the winner receiving a $100,000 prize. The deadline for this phase is still being determined. AEM is partnering on the challenge with crowdsourcing firm HeroX.